any one fitted a flashlube catch can. thinking of fitting a flashlube catch can to my rg colorado and was hoping I might get some feed back on them. I had a Provent 200 on my patrol and it did a great job after fitting it the intercooler was always clean free of oil. the flashlube is a smaller unit and will fit under the bonnet much easier. Re: any one fitted a flashlube catch can. I can't comment on the Flashlube unit, but I fitted Provent 200 between the brake booster & engine without much hassle in my RG. I fitted the Provent at 5000km, it now has 44700km. The oil & filter is changed every 7500km & empty between 100-180ml from it at oil change time. thanks underdog thats interesting, didnt think it would collect that much oil, so its a definite bonus having one fitted. I put a hpd catch can on mine, has everything you need to mount and install it and its machined alloy not plastic. it catches a fair amount of oil between services approx(7500km). it is worth installing one if you plan on keeping the vehicle for 150,000km or more. as far as I know the egr does not route through the intercooler, only the boost from the turbo runs through that so I have never thought to check it. I have looked into the air intake where the pipe comes from the catch can into the intake manifold and that's really clean, the hpd one does catch a fair amount of oil, I guess you could catch more if you put stainless steel wool(coarse stuff not the fine stuff) into the bottom of the can to provide more surface area for the oil to bind to. I should also point out i do have an egr blanking plate installed with a 10mm hole in it to stop error codes being thrown and the catch can does still catch a fair bit of oil. as for the engine cover I took that thing off and hung it in the shed. it serves no real purpose, if anything it traps heat in and seems to vibrate making more noise. Last edited by SomeCant on April 11th, 2017, 10:46 pm, edited 1 time in total. You are right, the EGR flow doesn't go into the intercooler. It is a totally different engine system. EGR flow is out of the exhaust manifold to cooler, to EGR valve and into the inlet manifold. The Hose from the catch can goes to the intake airstream before the turbo, haven't seen any which go into the intake manifold. What oil do you use, one which seals the rings better means far less blowby gas and therefore less oil mist leaving the engine and into the catch can. mydmax wrote: The Hose from the catch can goes to the intake airstream before the turbo, haven't seen any which go into the intake manifold. yeah I didn't mean the manifold its self I was getting at the pipe or airstream as you put it that goes to the manifold. the egr on the collie comes into that pipe just after the air cleaner/filter and looking at that pipework after the egr point its pretty clean, its not totally oil free when you rub your finger on it but it is still really clean. it would be a lot worse without the can for sure. I think you are mixing up the systems a bit. The EGR doesn't go into the intake, do you mean crankcase breather goes in there. If it was EGR exhaust gas flow it would then be going through the turbo and heating the intake air more than normal. It would also be BLACK in the turbo compressor. yeah you are right I mean pcv, don't know why I was thinking of egr. thanks for the photos somecant looks really neat. My question is more basic, does fitting one affect your warranty? Actually I checked, it does because they mess with manufacturer calibrated PCV, that can be good or bad, but since bad is a risk and good can't be proven the warranty is void. So don't fit one if you are under warranty. Also, I'm not sure I can see the overall benefit. What is the catch can 'protecting' anyway? Umm, diesels do not have a PCV valve AFAIK. Modern diesels use many emission control systems. The first was recircultaing the blowby back to the intake instead of venting to the atmosphere. Next was Catalytic Converters, then EGR systems (Euro 4), then DPF (Euro 5) and soon Adblu (Euro 6). 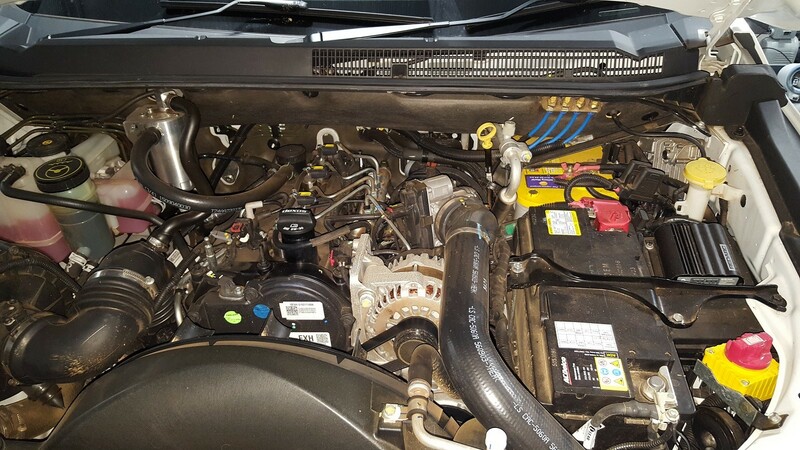 The advanatage of a Catch Can is the reduction of oil mist entering the intake manifold because the EGR system also vents into the intake manifold. Combine oil and carbon deposits and eventually you will clog the intake manifold.